It's hard to find dividend payers today that offer a decent combination of yield and a reasonable price. Here are three stocks that pay you each quarter that don't look like they've been bid up too far. They may not be perfect, but Emerson Electric Co. (NYSE:EMR), ExxonMobil Corporation (NYSE:XOM), and Eaton Corporation (NYSE:ETN) are all worth a closer look if you have some cash to invest. Of this trio, Emerson Electric is the standout dividend performer. The company has increased its annual dividend for 59 years, an impressive feat. And right now, the yield stands at approximately 3.5%. That's not a number that will cause you to jump for joy, but when the S&P 500 yields closer to 2%, it's notably above the norm. But here's the thing: Emerson's yield isn't as high as it has been in recent months, but it's still at the high-end of the company's historical yield range. What's going on? For starters, Emerson is an industrial company. It's something of a cyclical industry, and it's facing some headwinds today. That includes generally slow growth -- or worse -- in developed markets, and slowing growth in emerging markets, notably China. So Emerson is expecting fiscal 2016 to be a difficult one, with underlying sales down between 2% and 5%. Fiscal second-quarter underlying sales fell 5%. Despite many headwinds, the company earned $0.57 a share. Emerson is working hard to keep its core solid, and improve where it can. Interestingly, the recent margin weakness at process management and industrial automation is expected to set up easier comparisons later this year. These businesses could start to look better soon. Emerson is also in the process of spinning off its network power business, the lowest-margin business it runs -- which should, once complete, improve the company's overall operating margin. In other words, Emerson may be struggling a little today, but it's setting itself up for a better tomorrow -- and you can collect a nice dividend along the way. Although this year has been better for oil prices, they are still low by historical standards. 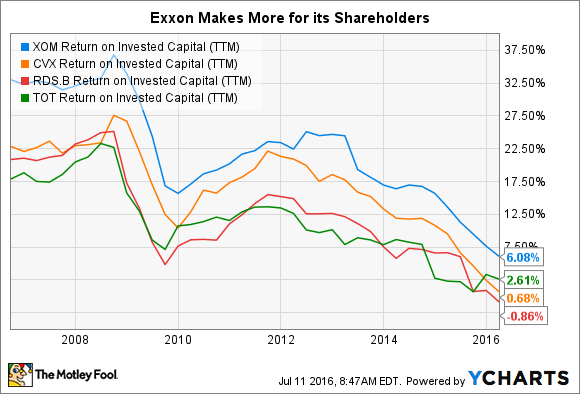 That's left Exxon's results predictably weak. How bad is it? Earnings were down 63% year over year in the first quarter. Exxon hasn't been sitting still, though, it's been adjusting to the new environment. For example, capital spending in the first quarter was down 33%. That continues a trend that's been seen throughout the industry. And the outcome of Exxon's efforts has been pretty good: The oil giant is still making money where competitors are bleeding red ink. Sure, earnings were off by nearly two-thirds, but the oil giant still made $0.43 a share. Chevron, for comparison, lost $0.39 a share in the first quarter. Now add two more pieces to the puzzle. Exxon has historically bested its peers on return on invested capital, arguably making it one of the best-run oil majors. And while its yield is lower than recent highs, it's still at levels not seen since the turn of the century. The 3.1% yield also has a notable edge over the S&P 500's yield. The big question is whether or not Exxon will be able to keep paying the dividend, which is the risk here. Right now, Exxon, like its peers, is tapping the debt markets to support growth spending and shareholder distributions. But with such a long history of dividend increases, a relatively high yield relative to its own history, and a still-profitable business, this looks like a risk worth considering. Eaton Corp. is a harder sell on the dividend-increase front because its annual streak is only seven years long. However, that's because the global industrial giant, focused on power management, took a pause during the deep 2007 to 2009 recession. It basically held the line on the dividend for nine quarters before starting to increase again. Eaton's dividend hasn't gone up every year, but over the long term it has trended regularly higher. 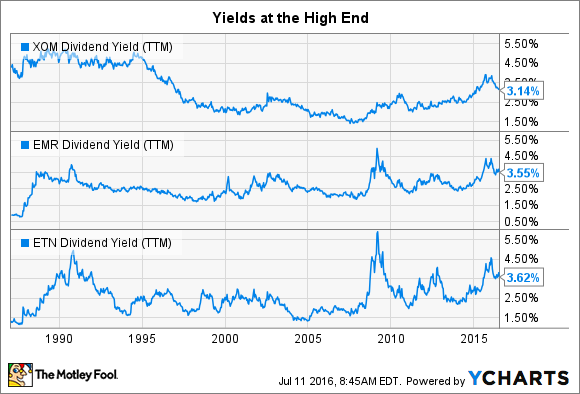 And right now, the yield is nearly 3.7%, the highest of this trio, and like the others, toward the top-end of the company's historical range. Just like Emerson, Eaton has been hit by a weakening global economy. It's expecting organic revenue growth to be down as much as 4% this year. But cost-cutting over the past year or so should help reset the business so it can better compete in today's environment. For example, excluding restructuring costs, the company's operating margin in the first quarter improved around 30 basis points. So it's using this downturn to strengthen its business, which is just what you'd expect it to do. It's also worth noting that, despite the weak environment, Eaton is also quite profitable. It earned $0.88 a share in the first quarter, and is targeting between $4.15 and $4.45 a share for the full year. Basically, the company is looking for flat earnings, year over year, on lower revenues. And with its share price relatively cheap, it's been buying back shares, too. So there's more than a few things to like here -- which is why you might want to collect this reliable dividend while you wait for better days. Low bond yields have led investors to risker assets in a search for income. Stocks have been a prime beneficiary, leading many income-oriented stocks to notable price rallies. In this environment, you have to step back and look at the company behind the yield. You may have to take on some added risk to get a higher-than-market yield; but if you understand the companies you are looking at, the risks may not be as big as they appear. Emerson, Exxon, and Eaton all look like relatively high-yield stocks worth the risk of an investment if you're seeking out stocks that pay you each quarter.